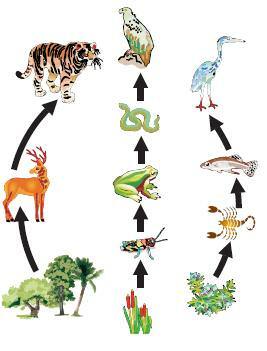 This article talks about how different a food chain is from a food web, and vice versa. Let’s look at the facts. Follows a single and direct path as it shows the connection between organisms have as determined by the food they eat. An accurate and systematic grouping of organisms as determined by the prey and predators they have in common. Linear, interconnected links that make up a food web. A complex network of food chains. A food chain illustrates how organisms are connected to each other as determined by the food they eat. It also makes up the many interconnected links in a food web of any given ecosystem. There are several levels in a food chain, called trophic levels, which correspond to positions that organisms are placed in the chain. It starts at the bottom with producer organisms such as plants that make their own food. The link ends with the apex, or the alpha predator, and the detritivores, such as vultures, earthworms, and fly maggots. Then there are the decomposers, which are fungi and bacteria that return the nutrients from decayed animal or plant remains back to the soil, completing the whole cycle. Excluding producers, all organisms that make up a food chain are consumers. Food chains can be at least three levels in length, and can be as many as six or more. A food chain with four trophic levels can start when a rat eats a plant – a snake then eats the rat, and an owl eats the snake. When the owl dies, its remains are broken down by various fungal and bacterial species. Simply put, a food chain shows the succession of organisms that eat others and are eaten by others in turn. All food chains begin with a producer, which makes use of energy radiated by the sun or chemical energy for making food. Then there are the consumers, or organisms that consume other organisms. Excluding producers, all organisms that make up a food chain are consumers. A food web is an interconnection of food chains in a given ecosystem. Each and every organism is part of several food chains, and each food chain is one possible route for food and energy to take within an ecosystem. It shows how plants and animals are connected by different paths that are crucial to the survival of each one. Each part of the food web is important, and to have one part missing can endanger everyone else connected to that ecosystem. Food webs are used as models of actual ecosystems, as they systematically and accurately group various species according to the same prey and predators they have in the food web. A food web is divided into different levels. At the bottom are the basal species, which include organisms called autotrophs (organisms that make their own food) and detritivores that decompose organic materials. On the intermediate levels are animals that eat both plants and other animals (omnivores) of more than one trophic level. These are organisms that cause energy to travel through several pathways that start from the basal species. Sitting at the very top are the alpha predators, which are animals that have no natural predators. So what’s the difference between a food chain and a food web? A food chain follows a single, direct path (one organism at a time) as it shows the relationship organisms have as determined by the food they eat. It is the linear, interconnected links that make up a food chain. A food web, on the other hand, is a complex network of food chains. It accurately and systematically groups organisms according to the same prey and predators they share in any given ecosystem.